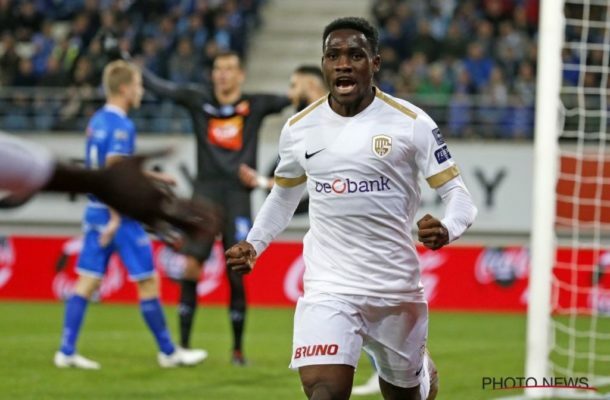 Genk midfielder Joseph Paintsil was selected as one of the best ten performers for last week's Belgian Jupiler Pro League Week 24. Paintsil was a second half substitute in the Dieumerci Ndongala on 58 minutes in their come-from-behind 2-1 win over Waasland-Beveren. He was selected by journalists of Sport/Foot Magazine who select the Top 10 of the best players of the weekend. 1. Yohan Boli (Sint-Truiden): He found the back net three weeks in a row. His first goal was the most beautiful, against Eupen. He took the ball in the side net, after a one-two with De Sart. 2. Manuel Benson (Mouscron): He made Charleroi defenders look foolish and saw his actions rewarded with an assist. 3. Paul-José Mpoku (Standard): The most decisive wheel of the season so far, at least in goals and assists. He proved it again in the clasico against Anderlecht. 4. Thomas Kaminski (Ghent): One month after the departure of Lovre Kalinic, nobody talks about Croatian anymore. Kaminsiki was well placed on the Club's various attempts. He had already been the man of the cup game against Ostende a few days earlier. 5. Razvan Marin (Standard): The people of Liège made their best winter transfer by not letting Romania leave. He scored a great goal and he is the hub of this Standard. 6. Djihad Bizimana (Waasland-Beveren): In possession of the ball, he could give it away faster but if Genk had so much trouble getting into the game, it's thanks to the way he held Pozuelo. 7. Brandon Mechele (Club Brugge): Week after week, the Red Devil is flawlessly defensive, whether or not the Club takes points. 8. Joseph Paintsil (Genk): entered half an hour away, he showed much more than Ndongala. He played well in the back of the defense. It remains only the finish. 9. Sammy Bossut (Zulte Waregem): With 50 goals against, he is the most frequent goalkeeper but he avoided Zulte to take more than two goals against the Circle with some interesting interventions. 10. Franck Boya (Mouscron): a strong man who clears everything in his area, in front of the defense. In addition, he has excellent technique and carefully revive the game.